The trail provides a walkway for people to enjoy a few pleasant, quiet moments free of traffic to stroll, bike, or cross-county ski. Additionally, the former train depot has been converted into an environmental education classroom and office. 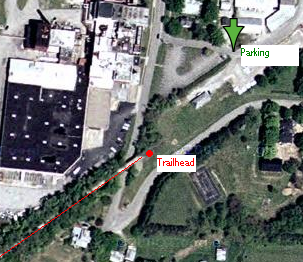 The Trailhead is elevated just above Columbus Street just South of S. Vernon Street in Sunbury. It is in Red in the satellite image, below. Do you have photos of this trail you'd like to share? Please e-mail them in, along with any descriptive information about the picture. 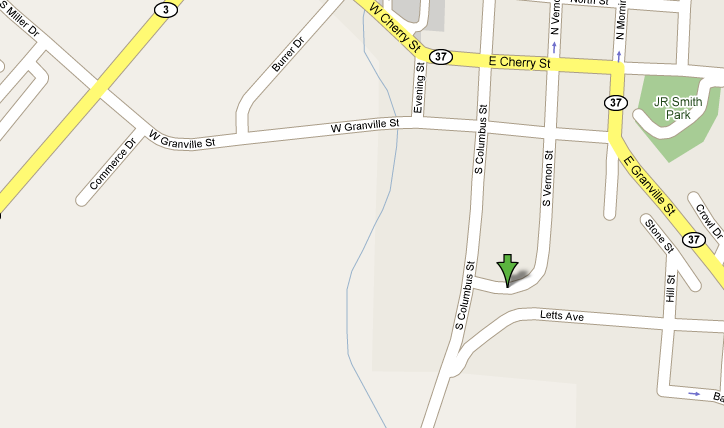 Where is the big walnut community trail at in Sunbury? I have been looking for a close park/place to walk my dog in Sunbury (We live on ST RT 37). From the intersection of SR36/37 and 3C, head east towards the Sunbury Square. At the first traffic light turn right and drive 4 tenths of a mile. When you see the railroad overpass you are at the trailhead. Park in parking lot on the left and walks towards the building to the left of the overpass. You will see the trailhead. You can also pick it up at the other end by parking at Big Walnut Elementary School. Walk behind the baseball field to pick up the trailhead.